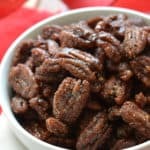 With the upcoming holiday season, Instant Pot Candied Nuts make the perfect DIY gift! That is, if you can stop eating them! Turn Instant Pot onto saute. Add pecans, syrup, vanilla, cinnamon, nutmeg, and salt. Saute ingredients until pecans are tender (about 5-10 minutes). Make sure to stir consistently so nothing burns. When pecans are tender, turn Instant Pot off. Add 1/2 cup of water. Select manual high pressure and set the timer for 10 minutes. If you have a newer model Instant Pot, you select the pressure cook button (because there is no manual button). Preheat your oven to 375 degrees while pecans are cooking under pressure. When timer is up, preform a quick release. Pour mixture onto a baking sheet and arrange in a single layer. Bake in preheated oven for 5 minutes then take out and flip. Place pecans back in the oven for another 5 minutes. When the timer is up, take pecans out and allow them to cool completely. Bag and enjoy! When the last 5 minutes is up and the pecans are out, allow them to cool about 10 minutes. Add your sugars in a little bowl and mix. Sprinkle mixture over the semi cooled nuts and stir it around. You don't need to use all of the sugar mixture. Allow for them to cool and dry the rest of the way then enjoy!